A public hearing tomorrow for the long-awaited protected bike lanes on Fell and Oak Streets could be key in determining how soon the project is approved and completed. Advocates say a strong show of support is critical to ensure the project is approved without delay. Although agency staff won’t make a decision whether to recommend approval of the project to the SFMTA Board of Directors tomorrow, hearing officers will take comments from the public that could influence the project’s design details and implementation timetable. 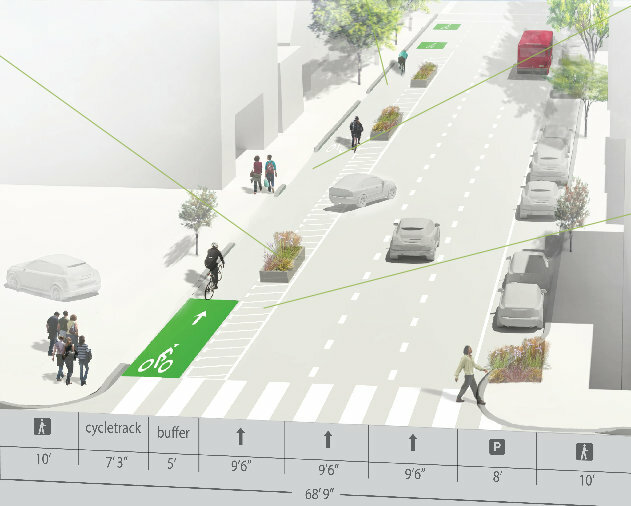 The project would provide vital safety upgrades for bike travel on the three blocks linking the Panhandle and the Wiggle — currently fraught with danger from high-speed traffic that deters many would-be riders and sometimes leads to confrontations between drivers and cyclists. Although the SFMTA says the project could be implemented no sooner than next spring, D5 Supervisor Christina Olague, a strong supporter and former president of the Planning Commission, told Streetsblog she thinks it can go in by this fall. The hearing takes place tomorrow at 10 a.m. at City Hall in Room 416. You can also email staff at sustainable.streets@sfmta.com. Make sure to state the true amount of parking space that will go away, it is NOT 90+ like some (*cough*Rob*cough*) will have you believe. Plus, RRP needs to be discussed but this project shouldn’t be put on hold waiting for something that should of been down 10 years ago. Street between Scott and Baker streets. only 80-100? I think we should shoot for removal of 200. …and the addition of others. @yahoo-O7O5PZTXGOCIF7RBYAYPHU36XA:disqus 57 of the 103 parking spaces will be replaced on nearby streets in an area without permit restrictions in order to alleviate the dangerous conditions which prevent people from choosing bicycling and relying less on their cars. Please don’t mislead by excluding pertinent information. I was trying to clarify by providing information from the SFMTA website. parking spaces for area residents. @yahoo-O7O5PZTXGOCIF7RBYAYPHU36XA:disqus It’s not 80-100, it is less than 60. If you RPP that area, that number becomes negligible, which is what I also stated. You’d better tell sfmta their website is wrong then. Perhaps we should. The figure of replacing 57 of those spaces elsewhere comes from the most recent community meeting. MTA staff are likely busy with more important tasks than keeping numbers up-to-date, but in this case it wouldn’t be a bad move to revise. Of course, we’re only talking estimates for the time-being. A lot needs to come together. Of course, we aren’t taking into account the added spaced made available when the DMV spaces were opened up to the neighborhood. People only tend to notice when spaces are taken away, not added, so there is probably still a net gain but that would go against the supposed “war on cars” that the SFMTA is not carrying out but the media is hyping up. Oh, those poor beleaguered motorists. Just so everyone’s clear, Shmoozilla and Virginia are the same person. foiled again! damn you IP address matching! I think it is more DISQUS issues than trying to fool anyone. She was shmoozilla for a long time before she signed in as Virginia. It’s not like Rob who can never reply to a thread just so his posts are at the top all the time. Shmoozilla and Virginia are one person who posts from different computers Aaron. There is no conspiracy here, as hard as it may be for you to believe. I enjoyed reading the comments about Streetsblog and about you in particular on SFBG. It seems your reputation is well earned. @yahoo-O7O5PZTXGOCIF7RBYAYPHU36XA:disqus Didn’t say there was a conspiracy. All I said is you’re the same person. It appears to other commenters that you’re not. Ah, yes, I see the comments from that great ol’ bunch. Virginia, if you use two different user names, it confuses people and distracts from the conversation. Aaron is helping sort that out since you aren’t able to properly use DISQUS.